As we planned our trip, it was important each person got to do and see their top two things. Keith’s top one was castles. As you can imagine, the rest of us Americans were pretty happy about that. We did see a number of castles, and even stayed in a place with a view of one in Cork County – Blarney. Before we arrived at Blarney, we took the train from Dublin to Cork. I love the train! From there we were to rent a car. Yikes! Driving on the other side of the road. Not me. Sean and Keith signed up as drivers, and Sean loved it. I admit, I usually sat behind the driver, not watching. I figured it was probably better for everyone that way. It is amazing how adaptable we are though. Each day it seemed more natural than the last. Arriving in Cork, we were on foot, looking for lunch and the car rental dealer. 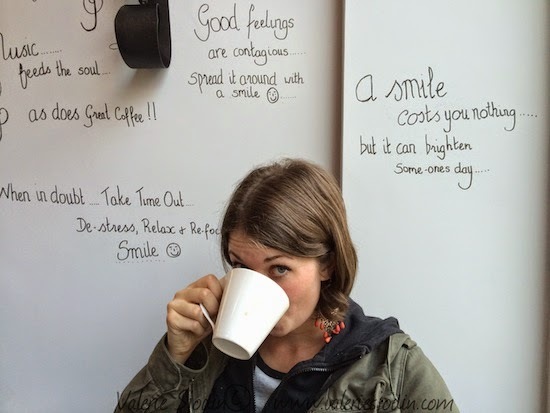 After walking a few blocks we came across a lovely cafe – such a blessing for travelers. 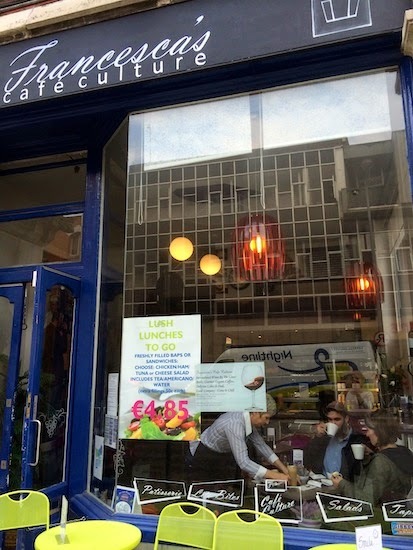 Francesca’s Cafe Culture. It was like an oasis. Wonderful food, coffee, and service! One thing we noticed that is quite different in Ireland, than in the US, is the sections of the castle are all open. A sign is posted that you enter at your own risk etc. It was nice for us to be able to roam around a bit. Happy & Blessed at Blarney! I'm so glad you are posting this trip with all the pictures. I won't be visiting any of the wonderful places you have traveled so I get a mini trip with each post! great photos– brought back great memories of my trip to Ireland in 2000!